For this project I order Angelus Leather Paint bottle of 4 oz. in 186 Hot Pink, 1 oz. in 198 Buttercup and 4 oz. in 5 - White. 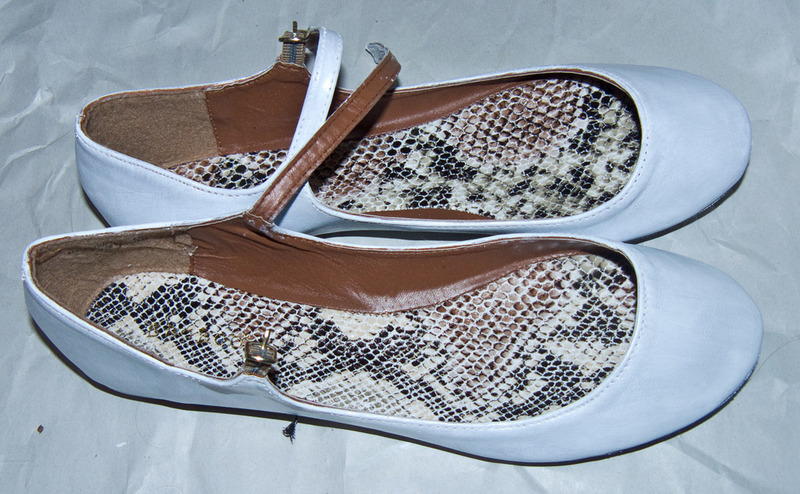 For a small pair of flats like these you will only need one 1 oz. bottle of what every colour you want your shoes to be and 1 oz. of white if your shoe is not already white. I got the larger 4oz size of these paints for another project I'm doing as well latter. I ordered the Angelus Leather paints and matte acrylic finisher from Dharma Trading. 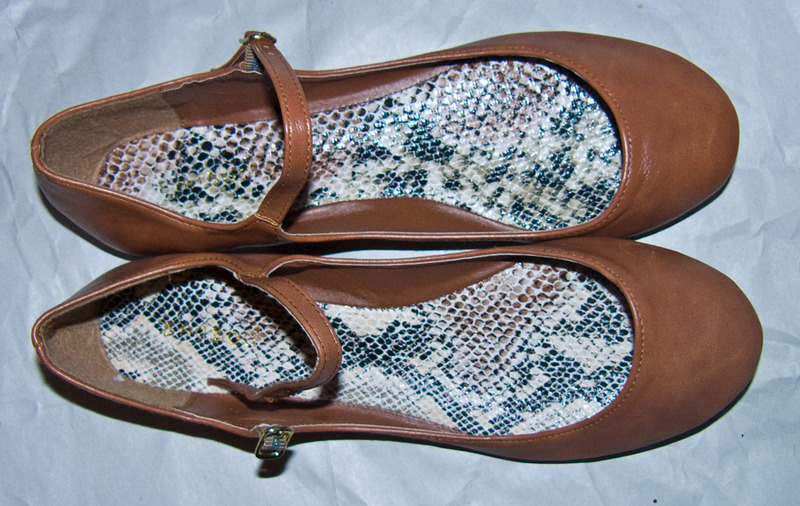 Step 1: Get your shoes! 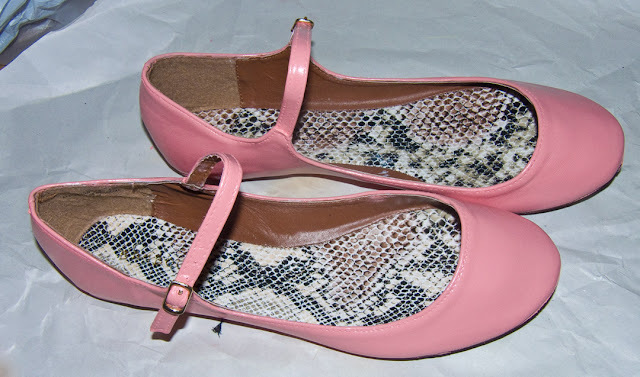 In this case the style was most important as the Character I'm doing wear Mary Jane with a strap closer to the ankle. 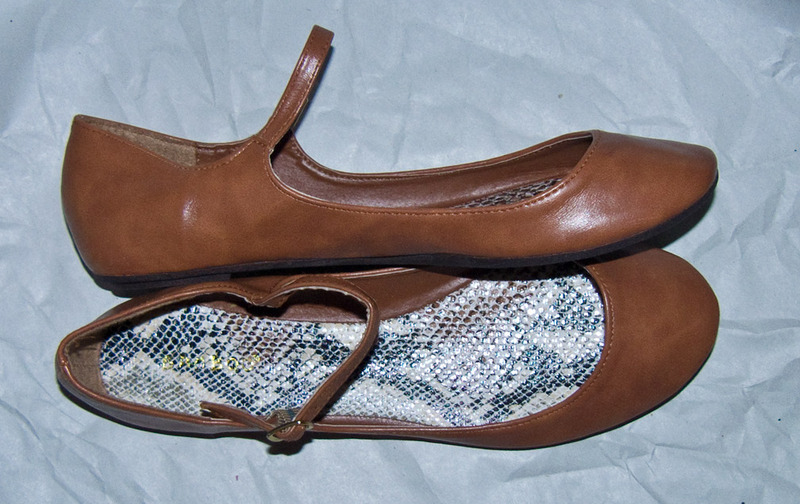 I got these from UrbanOG.com and are Bamboo Crush-25 Round Toe Mary Jane Ballet Flat in brown. Step 2: Prep your Shoes. 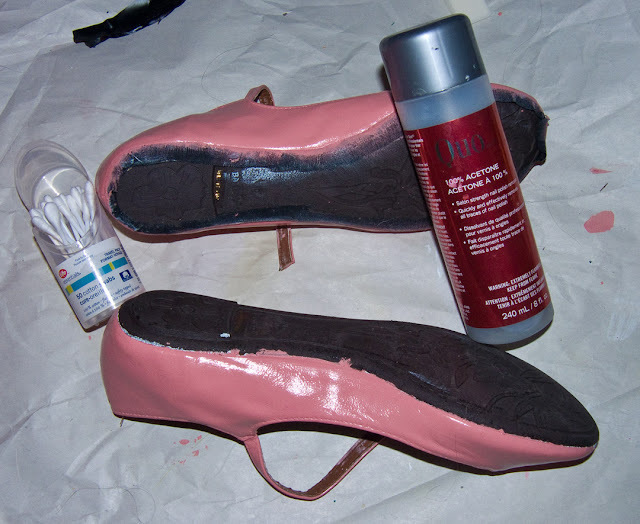 You need to prep your leather or synthetic pleather shoes before applying your paint. In this case I used basic extra strength nail polish remover that has acetone as the active ingredient. You can also use straight 100% acetone (you have to work quickly) or you can also use Angelus Leather Preparer and Deglazer instead. Simply use your cotton pads or cotton ball soaked in your remover and buff the cotton pad/ball into the surface to remove the gloss finish on your shoes or boot. This will also remove/lift any silicone glue residue from the shoes as well from gluing the sole in manufacturing. I had 2 silicone glue patch on these shoes that was invisible to the eye and had to pick it off in the end. 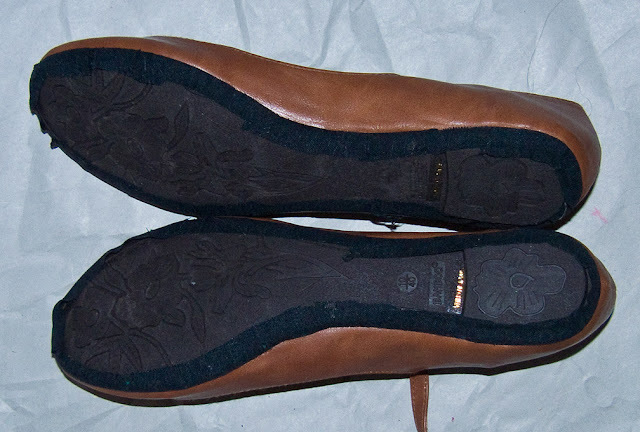 If you have a shoe with a "patten leather" finish that is synthetic you want to use 600 to 1000 grit sandpaper instead to remove the finish as it's also most plastic material. I recommend masking tape to mask out soles edge. 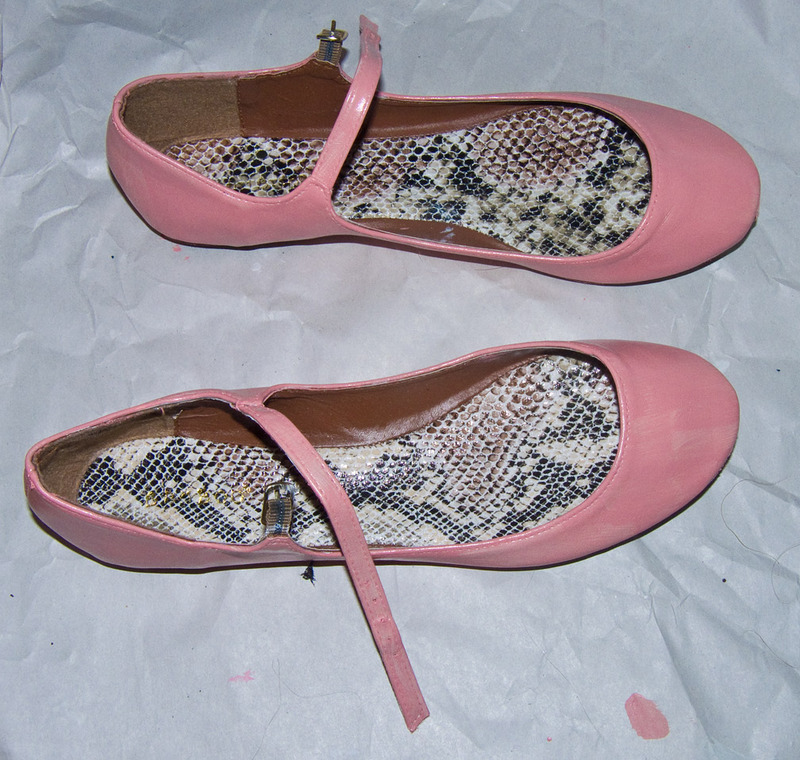 In my case the texture of the shoes are rubberised and pitted/bumpy making the masking tape not adhere at all. So I ended up using hockey tape instead. Now the time to paint you base coat. in this case I'm using white to mask out the brown shade. All you need is a larger rectangle tip brush and the paint straight from the bottle. Quickly yet thinly brush your first coat. It will look streaky and sheer but that's normal. Let each layer to dry completely and start to build up the layers one at a time. I stopped at four layers of the white, as you can see the colour is not 100% opaque but it's good enough to block out most of the original brown. Allow the paint to cure for 48 hours. I made a custom coral pink shade by blending the pink, white and buttercup shades into a new 1 oz container and basically made 1 oz of this new shade. Always test out your paint first as the paint dose dry darker then it look in the bottle/pot. Once you have your even coat allow the paint to cure for 48 hours. Then you can paint any designs you want on your shoes of boot and repeat the same painting times. Step 6: Add Finisher to seal your Paint. Most people might skip this for a costume but I found the paint still tacky after 2 weeks to the touch and had stuck to my shoe box causing a tiny patch to the surface of the shoe to lift off the shoe that I needed to fix. The Finish not only seals the paint but also preventing that sticking finish to the paint and also adds a desired finish. I chooses the matte version for it's low lustier finish. 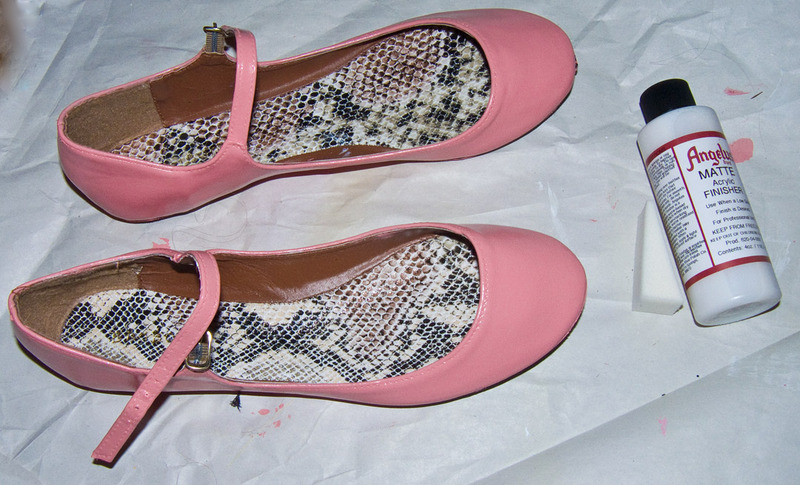 You only need to apply one sheer coat to the surface with a sponge or rag to finish the shoe. The finisher has a blue white colour to it when wet that if you see if it's too thick in an. You will need to sheer that thick area out if that happens. If you have any spills on the edged of your soles you can use 100% acetone to clean them off. In my case the texture of the sole didn't help you I ended up with a lot of bleed trough the tape. And your finished! Enjoy you new custom coloured shoes/boots. Just a note you can use Angelus Acrylic finisher for other project to seal you paint work as well so it can be useful for other pieces. This is cool! I didn't know you can do this! Is the shoe still flexible and does not crack ? It flexible which is why I love this particular paint. The paint is also designed to be thin so that if their are any fold cracks with wear and tear they are small/thin compare to other paints.